The future couldn’t come any sooner for Tyson Galloway. 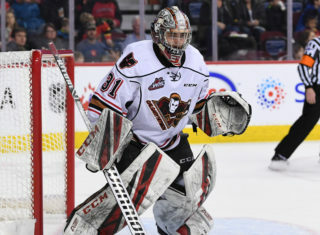 As soon as the 15-year-old was selected by the Hitmen in the second round of the 2018 WHL Bantam Draft, he couldn’t wait to get things started. 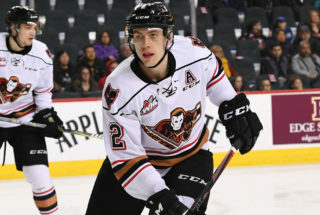 From rookie camp, main camp, to practicing with the club in late December and early January, he’s loved every minute of being a Hitmen prospect. “It’s surreal to know that I will be here experiencing this every day in the future,” Galloway said. “It’s been an eye-opener being around the team and seeing what it takes to get to this level. While the defenceman will have to wait a bit more before cracking the roster, he’s been busy putting in the work with his midget club the Thompson Blazers of the BCMML. So far on the season Galloway has amassed for 11 points, all assists, and has been a reliable presence on the back end helping the club jump out to a 16-10 record. “We have a great team that’s tough to play against,” he said. 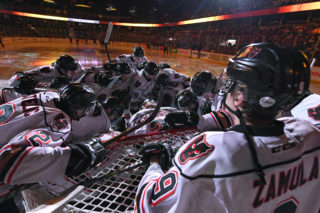 “I think we have a special group that Thompson hasn’t seen in a while and it’s amazing to say that I am a part of it. 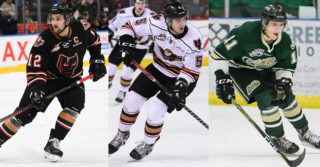 In addition to their strong regular season, the Blazers took part in the Mac’s Midget Tournament going up against other top midget teams in Canada and the U.S. Despite finishing the tournament with a 0-3 mark, all in all it was a vital learning experience. “It was the best competition we’ll see all year,” Galloway said. “We may have lost all our games but I think we were in every single one and it was a great experience for us. As the Kamloops native gears up for the final stretch of the regular season and playoffs, he’s made sure to keep what he’s learned with his time around the team in the back of his mind. Like a true student of the game. 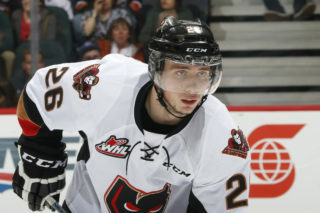 “When I watch NHL or WHL players, I try and take bits and pieces away from what they do to be successful,” he said. “I know that I have areas that I need to work at in order to get to make it to the higher levels. I want to get faster and stronger and improve my shot and be a reliable in all situations.